To mark the 90th Anniversary of the founding of the Communist Party two weeks ago, the seaside city of Qingdao in Shandong province opened its new Jiaozhou Bay bridge. 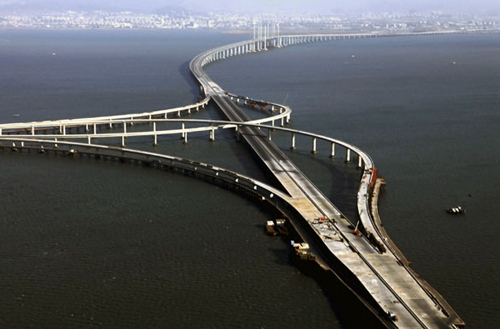 At 42.4 km, it is the longest sea bridge in the world. 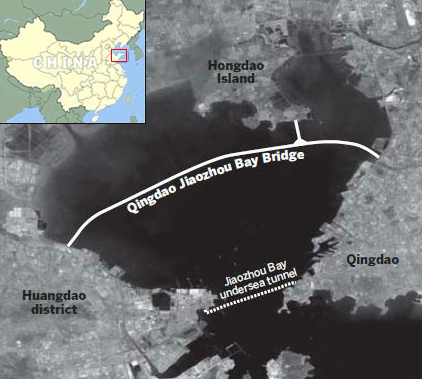 The bridge links historic Qingdao with the city’s industrial zone Huangdao. Dickinson touches upon what is potentially the most contentious issue about China’s infrastructure: the seldom examined cost/benefit analysis of these new projects. At this point the world knows that China can ‘get it done’ when it comes to building large-scale infrastructure projects. There is no lack of political will or labor to undertake such ambitious plans. Yet lost in the speed of getting these new projects built is a rigorous analysis of the ultimate benefits for what could turn out to be a series of boondoggles. That is not to suggest that this is not to be expected, especially given that China is a still a developing country. Surely, many of the infrastructure projects will have tremendous benefit now and in the future. I also posit that to some extent China’s leaders are aware of potential labor shortages in the future. As China’s aspiring middle-class urban dwellers move up the value chain, and as the one-child policy begins to take a toll on the country’s youthful demographics, cheap labor will become more scarce. Given this reality, China appears to be taking an approach that puts speed and ambition above all other considerations, waiting to deal with the details later on. In a sense, this is a cultural phenomenon: creating an environment of rapid growth to ensure social stability and avoid the internal chaos that is still all too near in memory.